Elinluv's Tidbits Corner: Yee Sang /鱼生 - Raw Fish Salad For Increase In Abundance & Prosperity ! 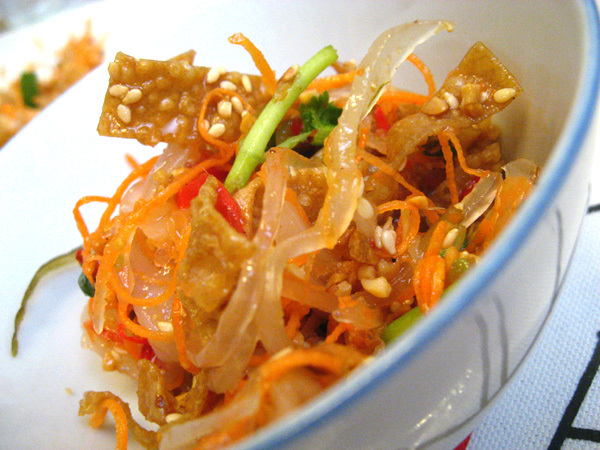 Yee Sang /鱼生 - Raw Fish Salad For Increase In Abundance & Prosperity ! Yee Sang/鱼生 is a Teochew-style raw fish salad. It consists of slices of raw fish ( slices of salmon or snakehead/ikan haruan ) mixed with shredded vegetables , crunchies and a variety of sauces and condiments, among other ingredients. Yee Sang means increase in abundance. Therefore the tossing of this raw fish salad during the Chinese New Year is considered a symbol of abundance, prosperity and vigor. You can have this dish through out the 15 days CNY celebration. We had this on the 1st day and I didn't make this dish myself, I bought the ready packed ones from the nearby restaurant but I hope to make my own Yee Sang next CNY ! 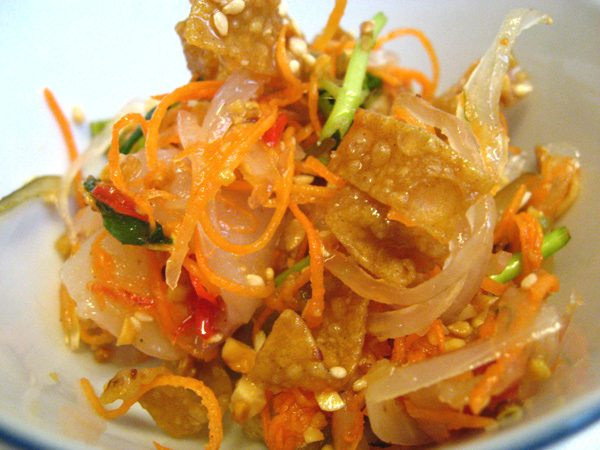 This Yee Sang consists of shredded carrots, cucumber, radish, pomelo pulps , crunchies , peanuts and sesame seeds and mixed with a special sauce which is made up of honey, 5 spice powder , oil and lime juice. Elin, wishing you & your family a very Happy Chinese New Year. 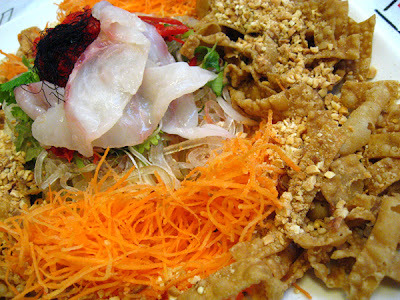 祝你合家 ： 新年快乐 心想事成 身体健康！ 恭喜恭喜！Oh boy, how I love having this yee sang. Planning to make my own. Hopefully, I have enough time to prepare this in 2 days time. haha... Wish me luck! Hope you're enjoying your day. 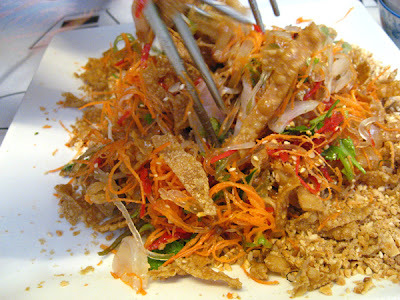 I absolutely love yee sang but sadly haven't had it in years. I love all the different textures and tastes . It is truly a great celebratory dish. Happy New Year! Love yee sang. It's not only fun but delicious too! Hope you're having a wonderful Chinese new Year! Sigh! I did not have that...so no abundance, no prosperity in the Rabbit Year lah? No wonder by the3rd day, already eating porridge! LOL!! Ooo, Elin, this looks amazing! Biren (roti & rice) also made yee sang. I've never heard of it before but it's cool to see how people make it differently. I love this, had this thrice already .... Yes, everybody lo hei for prosperity and advancement in their respective careers! Happy Chinese New Year! 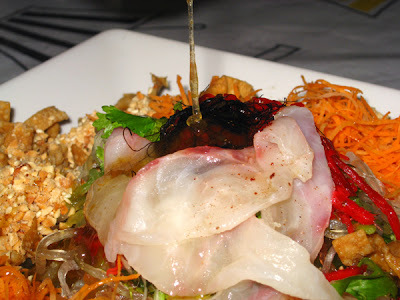 The raw fish salad looks delicious! Love this dish! Even though I ate it 3 times already so far, but still can't get enough of it, lol! Wishing you and your piggies a prosperous and fortune full rabbit year ahead!! Btw, looks like I'll be missing you bloggers this weekend *sob* hope you ladies have loads of fun yah! Cheers!